... but I'm going to take that phrase one step further and refer to "it" as the gold standard of home stand mixers. First, let's talk a little about how I arrived at this quirky idea. I own a KitchenAid Pro 6 stand mixer. I've never really been happy with it. For $370.00, what I paid for it, this mixer is categorized as a light duty mixer. It is loud. Oh so loud. It jumps around the counter top if I ask it to do anything slightly difficult so I'd best keep my hand on it. And how many times am I going to have to fix this beast? A new circuit board with speed control is shipping to me this time to the tune of $60.00 as I ready it for a quick sale or give away to someone who will not ask it to do anything more difficult than cupcake or pancake batter. Everyone knows KitchenAid mixers took a sharp nosedive when Whirlpool took over but I'm still going to step on a few toes here and say it's worse than that. 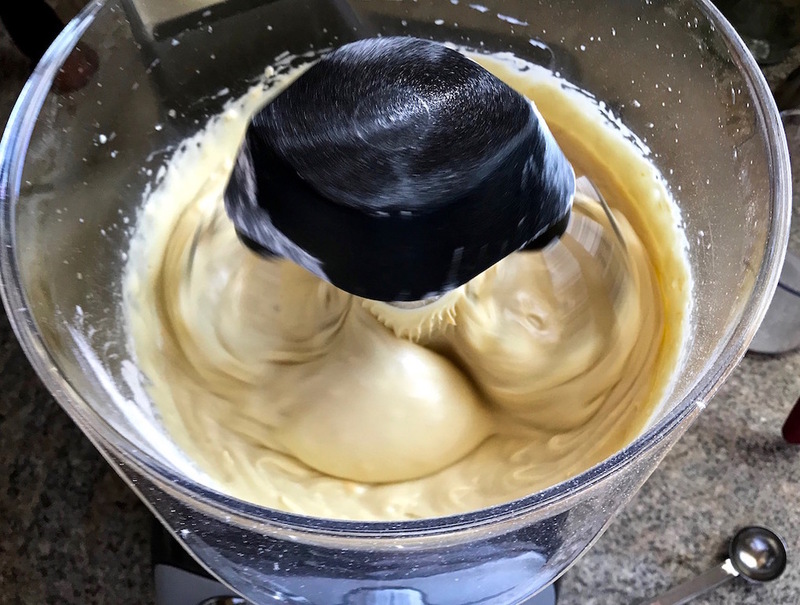 My KA Pro 6 stand mixer is an expensive piece of crap. Luckily, I didn't spend a lot buying attachments for the thing. I own the Meat Grinder attachment, also crap, which comes with sausage stuffing tubes which are, you guessed it, crap. I also own a set of pasta rollers which I have been very happy with. To bad the machine has to struggle so hard mixing pasta dough for these rollers. I once tried to mix a double batch of pasta dough with my KA and it sounded like I was mixing a live cat that smelled like burning electrical components. Enough already. "It" has gone by many names over the years. Magic Mill, Electrolux, DLX, and Verona are a few but now it goes by the moniker Ankarsrum Assistent. Designed and built in Sweden, assistent may be a misspelling here but I have no doubt it is correct in Swedish. 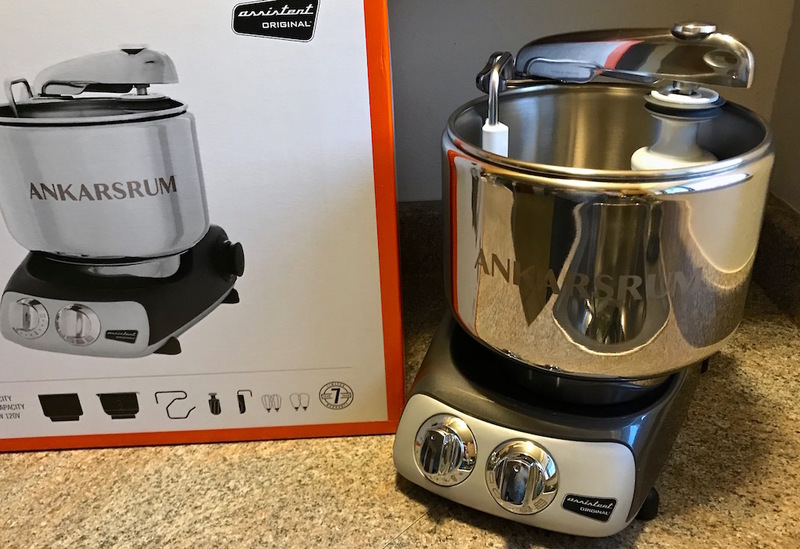 My Ankarsrum Assistent Original arrived yesterday afternoon and I'd like to go over a few key points that make this machine what it is. -It is very heavy duty. The dough hook may as well be a lug wrench. I first learned of the Ankarsrum Assistent on another forum from a member who takes bread baking to a high level. She prompted another member who's KA had just bitten the proverbial dust and began to research the mixer. Turns out another member living in Norway knew quite a bit about the mixer. His mother raised the family with an Electrolux Assistent (same mixer, different name) and claimed to have run countless amounts of reindeer and caribou through the Ankarsrum's optional meat grinder. The rest of the family all bought Ankarsrum Assistents based on their experience with that one mixer which is still in operation today. At $700.00 for the basic package, this is not a cheap piece of equipment. A new model has popped up in 2017. The 6230. The only difference between the 6230 and the 6220 that I ordered is the two knobs have been upgraded from durable plastic to metal and the warranty has increased from 5 years to 7. Ankarsrum is currently depleting their old model stock at a discount of $100.00 over the new model. These mixers never go on sale so now id the time to buy. Accessory attachments will drive the cost even higher but as I stated earlier the accessories work. $160 for the grain mill attachment sounds high until you compare it with a stand alone mill. $185.00 for the meat grinder attachment sounds high until compared with a quality stand alone meat grinder. One person I trust said he can grind meat at the rate of 240lbs/hour with the Ankarsrum attachment. I'm trying to be brief here so I'll leave you with a few video's that can illustrate how to correctly operate one of these machines. It is not a planetary mixer and the rules are different. The learning curve is short but necessary and many You Tuber's have posted inaccurate methods. 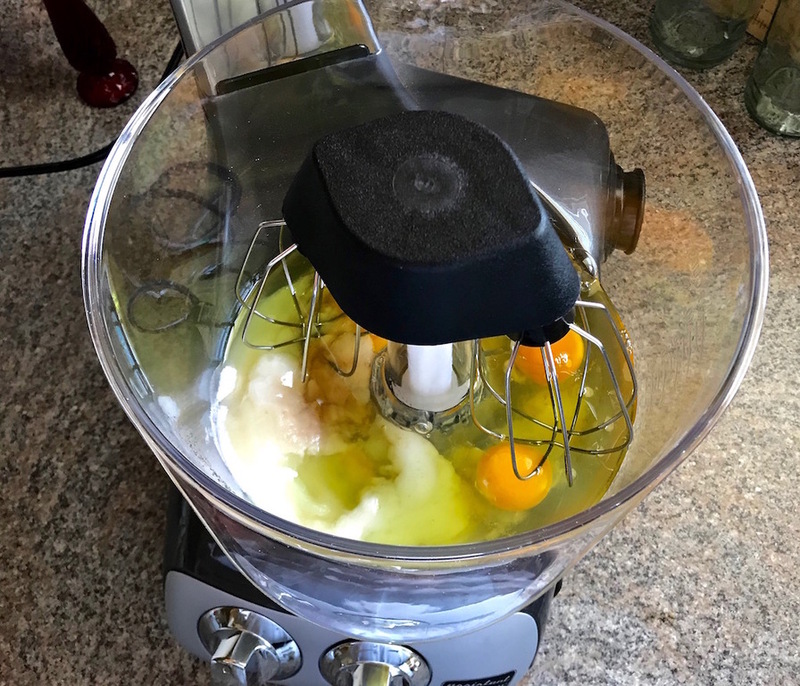 Blueberry Muffins were my inaugural use of this mixer using the dual balloon whisks in the whisking bowl. The action is very smooth and even. 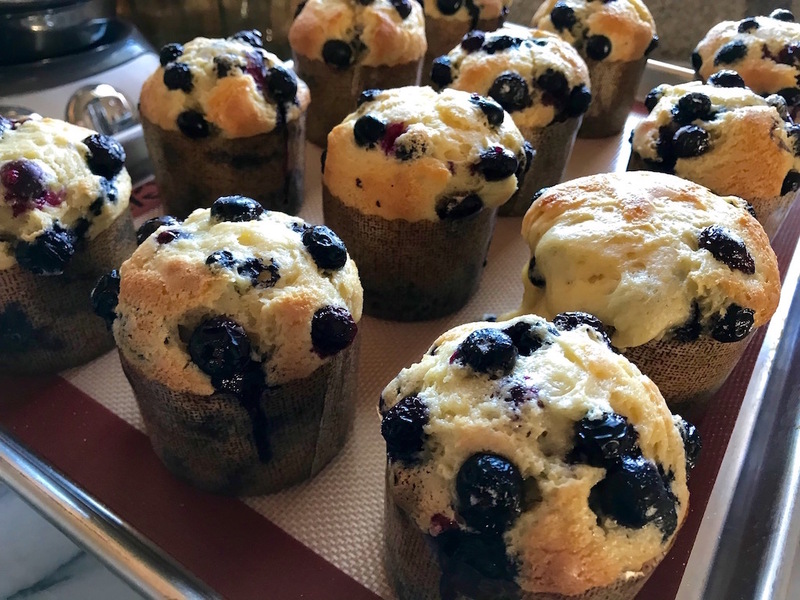 Jumbo blueberry muffins are a delight. While I generally disagree with you on the Pro 6 GMan, there is one problem I've run into: You can't whisk a small amount of product. The bowl/whip combo needs volume to work properly. If you don't fill the bowl at least to the ogive, nothing much happens. How is this unit in that regard? Could you, for instance, whip just a few egg whites for merangue, or similar items? 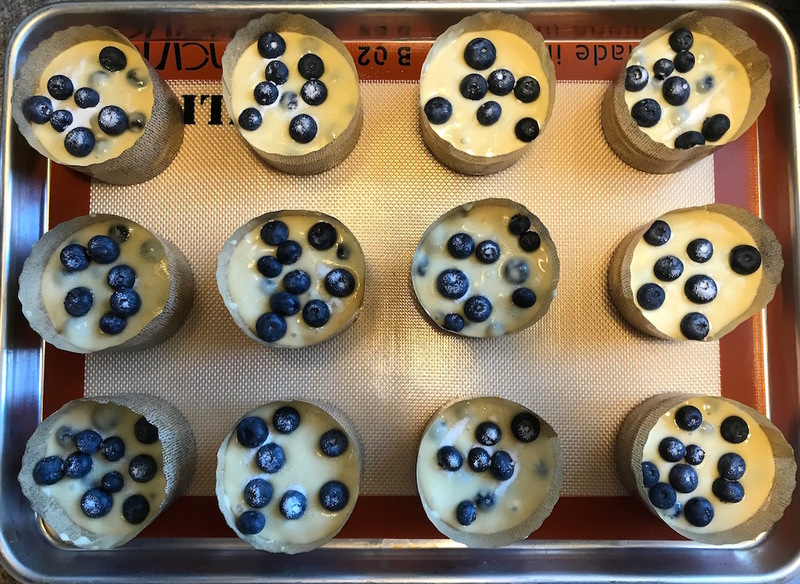 Those mini-panettones look great, btw. I know nothing about the merits of the appliances, but those are some beautiful, beautiful muffins. Yeah, those little paper molds do wonders for presentation. Half the battle sometimes. I know a lot of folks here own the Pro 6 and love the thing so I didn't expect to get much support on my rather inflammatory comments regarding this mixer. That said, something came to my attention, again, when ordering my latest part to fix this hunk of noisy underpowered and overpriced hunk of metal. My model number KA Pro 6 is not listed on any appliance parts web sites. Older models are listed. Newer models are listed. But not mine. This is called a "orphan" in production vernacular. Sort of like "the only one of its kind". I had to call and ask which part to buy for an unlisted model number. The folks at Appliance Parts Pros had to find the service manual for this particular mixer so they could figure out which part(s) would work with it. So I must concede my particular model number may have been quickly discontinued for some unknown reason and I am the proud owner of an "orphan". And a lemon orphan at that. I would have been much better off with a hand held. I remember one of the first things I did with my KA was to adjust the beater height because it wasn't cutting stuff like whipping egg whites at all. I still have the thing and will do a side by side egg white whipping test between the two. 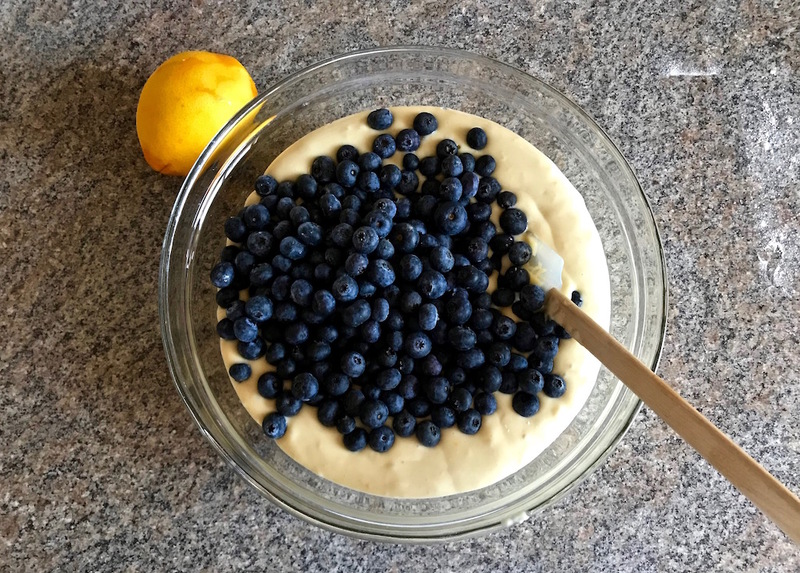 One egg white is probably a lot to ask of any stand mixer but it will be fun to give it a try. At the moment I'm locked into Thanksgiving mode and my daughter blew in unexpectedly, which is awesome, but she left her laptop elsewhere and seems to have commandeered mine so I'll do this a bit later. I don't reckon one egg would be a test of either machine, Gman. The Pro 6 has trouble with a half-dozen. At least mine does. There was a time when the Pro models were all crap, cuz they had gone to plastic gears and the like. But they rectified that, due, no doubt, to the volume of complaints.